Jarface is the unashamed result of Alternative Rock, Grunge, Metal and Stoner Rock all meeting up at a truck-stop restroom for some sweet, baby-making good times, and they are back at The Brunny to welcome back our boy Sean after his spiritual journey through China in search of the dankest memes not yet known to the western world, to once again slappa da bass! 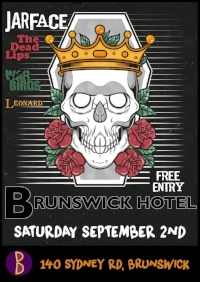 Helping us out are our good mates The Deadlips, Warbirds, and Leonard, so you know that September 2nd at The Brunswick Hotel will only be about 3 things; Riffs, beers, and intelligent conversations about how jet fuel can’t melt dank memes. once again slappa da bass! beers, and intelligent conversations about how jet fuel can’t melt dank memes.